Final Placements for IIM Ahmedabad concluded recently, with all 378 students achieving placements by the third cluster. The summer placements at IIM Ahmedabad had been equally impressive, in terms of the sheer number of marquee names, and the number of students hired by these names on campus. IIM A has repeated its blockbuster performance during finals. Accenture Strategy Consulting hired 18 students at the final placements, and BCG hired 15 students. All these are figures for the PGP programme. Our report on IIM Ahmedabad’s placements is an unverified report.IIM Ahmedabad publishes its report only in the CRISIL-audited IPRS format. Although this format includes very detailed and granular disclosures, it does not give data on profiles for which the students were hired. We hope to publish this data verified by IIM Ahmedabad in the future. The following data and statistics are based on data collected by InsideIIM from public and other sources. The level of information is less than what was available for the summer placement report we had published earlier. Yet again, it has been observed by recruiters that recruitments at IIM Ahmedabad were carried out in a very professional manner, (more so than the other top B schools in India). And again, the focus was on matching job preferences rather than achieving 100% placements. 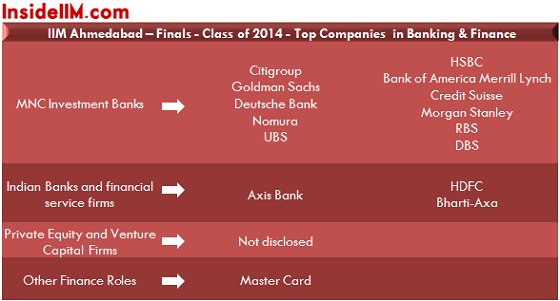 Banking: Most of the marquee MNC investment banks have recruited from IIM Ahmedabad. Unfortunately we do not know exactly what roles were the graduates hired for (whether front-end roles, middle office and operations roles, corporate banking roles and so on). HSBC was the largest recruiter in this space with 9 offers. The level of data is much lower than the summer placement report, where some private equity and venture capital funds had been disclosed as first time recruiters (Indus Balaji, Kalaari Capital etc). 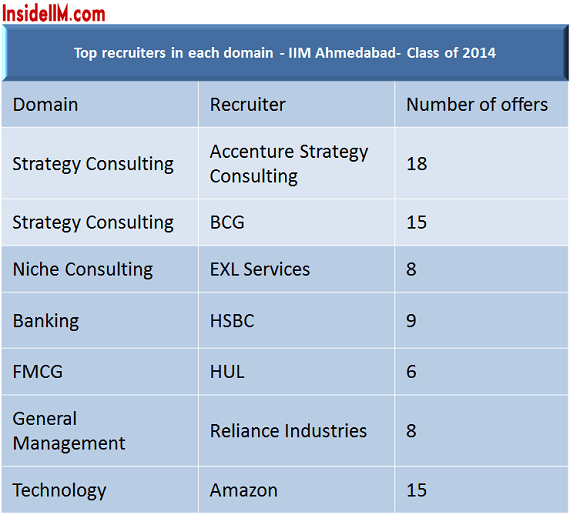 Consulting and general management: Again, recruitment for consulting and General Management roles only serves to demonstrate the hold that IIM Ahmedabad exerts over India’s top recruiters. Accenture strategy was the top recruiter in the consulting space, giving 18 offers, closely followed by BCG which gave 15 offers. 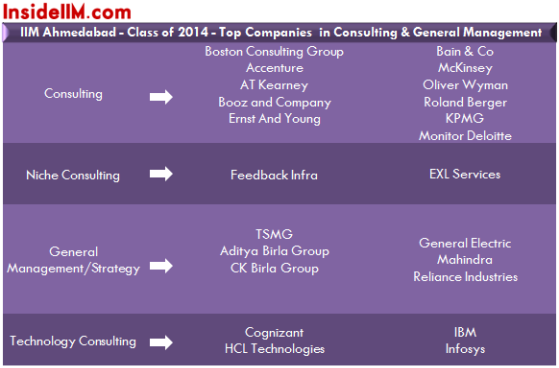 All the blue-chip strategy consulting firms hired in big numbers. Reliance Industries was a major recruiter in general management and strategy roles – making eight offers. One does note that TAS is the only notable absentee from this list. 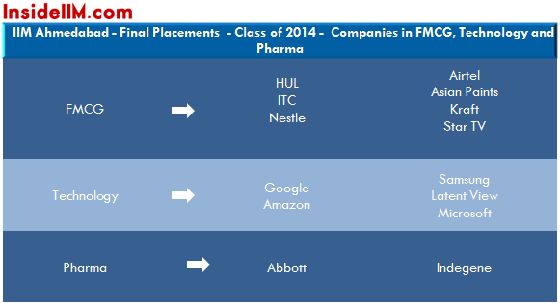 FMCG, Technology and Pharma: All the major FMCG companies have recruited from IIMA. HUL was the largest recruiter, making six offers. (Star TV made six offers as well. We would classify Star TV as a media business rather than an FMCG business). P&G is the only missing big name recruiter from the list. In technology, Amazon was the largest recruiter, making 15 offers. Conclusion: Although the data is not complete, it does give a picture of the strength of placements at IIM A. It helps establish IIM Ahmedabad’s pre-eminent position among B schools in India, and indeed, the world. Despite their not sharing data in the InsideIIM format we have to admit that their process transparency is unmatched in India. As usual, top notch placements by IIMA… A small query, what is the difference between accenture management consulting and accenture strategy?? are the two the same?? Hi @Team InsideIIM, when can we get to see IIM B’s report?? With all due respect, would be kind enough to reveal your identity so that readers are able to gauge the veracity of your comments instead of maligning the reputation of a premier institute? Also, I guess you belong to an institute miles ahead of IIMC, given the way you find faults with those who have been able to get admission in this coveted institute. Please not that I do not belong to IIMC; rather I respect the institute and the students who are a part of it.